The comedian/actor has received high praise for his new performance that premieres tonight. He plays a beloved children's TV show host -- like Mister Rogers -- whose life is hit with some dark, devastating events. The off-camera life of the man famously known as Mr. Pickles is falling apart. 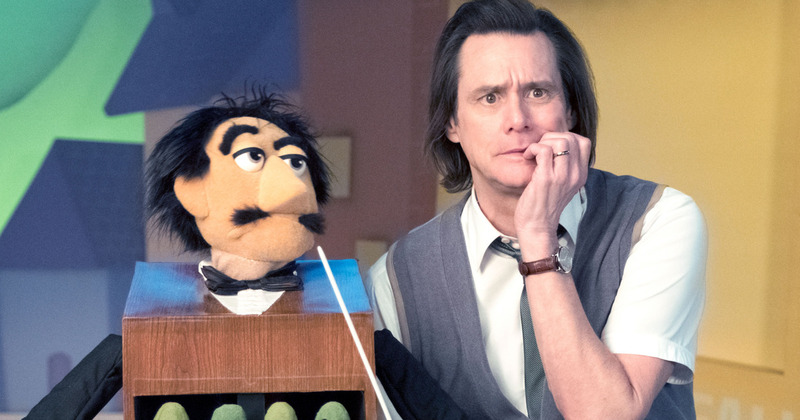 Entertainment Weekly printed that "Jim Carrey does his best work in years in dramedy KIDDING." The first half-hour of this ten- episode drama/comedy airs tonight. Six of the ten episodes were directed by Michel Gondry. He's the man who drew a strong performance out of Carrey in the 2004 film ETERNAL SUNSHINE OF THE SPOTLESS MIND. 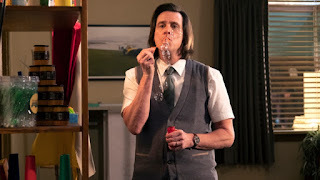 KIDDING airs on Showtime. Rolling Stone wrote "Jim Carrey makes a triumphant return to TV with a moving, lived-in performance..." Remember that Carrey was a cast regular on the IN LIVING COLOR comedy sketch series on TV back in the 1990s. The Hollywood Reporter said "Carrey is superb as a man who, like Fred Rogers himself, really is that nice on and off set." I want to see KIDDING because I'm always fascinated to see comedians flip the coin of their image, their brand persona, and play the dramatic side of the story. Way back when I gave in to a dear friend's constant urging and started this blog, one of my early pieces was about my wonderful encounter with a then-unknown Jim Carrey. This was when I new to New York City television and had just started my two years of work on WPIX TV/Channel 11. We had a weekday local magazine show. On it, I did occasional celebrity interviews. Lauren Hutton was scheduled. I'd interviewed her during my previous job and she remembered me when I went to greet her in the greenroom. She pulled me aside and ask for a small favor before we started taping. There was a guy in her new comedy, ONCE BITTEN, and she felt he was meant for stardom. He'd tagged along with her for a couple of her press appointments. She asked if he could go on with her for the interview so viewers could be introduced to him. The guy was Jim Carrey. This was a supremely gracious gesture from the woman who was the star of the film. I had no problem with adding this unknown to the interview segment. Jim Carrey went on with Lauren Hutton...and killed. Warm, quick-witted, a charismatic dude with elastic facial muscles. The camera guys were laughing. When you break up the camera crew, you've struck gold. This funny, fresh-faced, polite new actor had won us over -- well, just about all of us. Our stuffy producer remarked, "He's silly. He'll never get anyplace." Five years later, he debuted on a new Fox TV comedy series called IN LIVING COLOR. We were so grateful to Lauren Hutton that day at WPIX TV. Few folks recall her 1985 vampire comedy, ONCE BITTEN. But ten years later, Jim Carrey would be one of the biggest movie comedy stars in Hollywood. Millions of moviegoers remember 1994's box office blockbusters ACE VENTURA, THE MASK and DUMB AND DUMBER followed by THE CABLE GUY and LIAR LIAR. Early in his career, Jim Carrey showed his ease and skill with dramatic material. Did you ever see the 1992 TV movie called DOING TIME ON MAPLE DRIVE? We see the dysfunctions, heartbreaks, secrets and lies of an upscale white family. One son drinks, another attempts suicide because he's a closeted gay. Carrey played the son with the drinking problem. He delivered a stand-out performance. Early in 2009, Sundance premiered a new Jim Carrey film. Based on a true story, it took a poke at the attitude of the George W. Bush administration. I LOVE YOU PHILLIP MORRIS has a bold, provocative, funny and praiseworthy performance from Carrey. But the film seemed to have been shelved. Odd, considering the tremendous and profitable movie stardom Carrey had achieved. Two years later, Ewan McGregor -- Carrey's co-star in I LOVE YOU PHILLIP MORRIS -- was on GOOD MORNING AMERICA promoting another project and he was asked when his film with Carrey was going to be released nationwide. McGregor didn't know. I saw it on DVD. 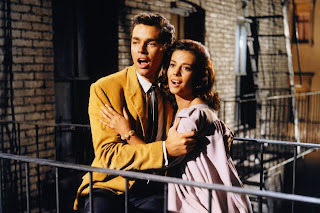 I can't recall it playing in any New York City theaters and I can't recall any big promotion for it. I saw it on cable a couple of times a few months ago. I watched it a couple of times because I'm that impressed with it. Especially Carrey's commitment to his character. I think the film was withheld because, like with the cop buddy/crime thriller KISS KISS BANG BANG with Val Kilmer as a gay L.A. detective, the lead male character is a tough, street smart, openly gay man who is no one's victim. Carrey plays a Virginia Beach cop and family man leading a pretty traditional life -- except when he realizes that he's gay. He's also discovered something about his childhood. A lie that made him an outsider and put a hole in his heart. Well, he comes out of the closet, gets a divorce, relocates to Miami and gets a boyfriend. Then comes another realization --being gay is expensive. The former cop becomes a con man to keep his boyfriend looking good and to keep sending money to the ex-wife and their little girl. By the way, he and the sweet ex-wife remained friends and speak often on the phone. He winds up in prison, where he runs another racket, and falls in love with a fellow inmate named Phillip Morris (Ewan McGregor). What I love about Carrey's performance is that he took elements of what his fan base loved in his comedy films such as LIAR LIAR and showed the dramatic side of the antics, the side driven by heartbreak. It's a sexually frank, unpredictable role and Carrey has definite chemistry with the gifted, versatile Ewan McGregor. I never thought I'd swoon at a men's prison cell scene with Johnny Mathis singing "Chances Are" being played as background music. I think Jim Carrey as an assertive, romantic top who schemes, steals and breaks out of prison for the man he loves unnerved some white hetero males in Hollywood marketing departments. I LOVE YOU PHILLIP MORRIS shows some good, solid acting work from Jim Carrey. You'll laugh, but he plays it all seriously which is the way to play it in this vehicle. He never sacrifices the wounded humanity of the character to insert some "Jim Carrey" verbal or physical sight gags. I'm eager to see him exercise his elastic dramatic muscles in KIDDING.